I've been on the road for nearly four months now and the number one food I miss is good, authentic chinese cooking. That longing alone was the sole reason that I decided to make the trip out to Flushing with my cousin, John-Paul, in tow. Like Sydney's Ashfield area, Flushing has become a focal point for chinese immigration and the result is an amazing variety of food from all regions of China, from Shanghai's dumplings, to Xi'an's pulled noodles and Beijing's roast duck. Besides Peking duck, and Mum's homemade chinese food, the two foods I love the most are xiao long bao (pork soup dumplings) and ròu jīa mó (a kind of chinese hamburger) and both are available in Flushing. Good xiao long bao is easy to find in Sydney so I have it each time I visit but I have yet to locate anywhere that serves decent ròu jīa mó since visiting China in 2008. Armed with the recommendations from the chefs at Eleven Madison Park, we headed out on the metro to Flushing. 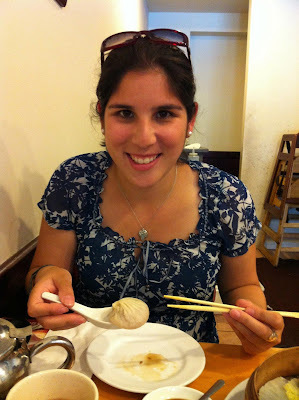 The first stop was Nan Xiang Xiao Long Bao on Prince Street. We ordered a serve of xiao long bao and a serve of shanghai sui mai. Traditionally sui mai are a yum cha dish of pork and prawn steamed in a yellow (containing egg) wonton wrapper so I was unsure what to expect. The shanghai sui mai arrived first and they were a mix of sticky rice, pork and seasonings in a white wonton wrapper (no egg). I loved them but needed to have some self discipline to ensure I had room for what was to come next. After about 15 minutes, the basket of xiao long bao arrived, steaming hot. Usually, I dive straight in and although I have mastered the art of eating the dumplings and not wearing the soup, I tend to burn my tongue. However in this instance, I managed to show some control and my tongue is scald-free. They were perfect! Better than Sydney and, in my opinion, better than the majority of dumplings I had in Shanghai as well. As soon as the soup hit my palate, I was delighted. Not only was it delicious, but the sense of familiarity and comfort was like a warm hug and any tinge of homesickness was forgotten in that first taste. Cravings satisfied, I think I am OK to hold out until visiting Hong Kong in November. The second stop on our tour was to Xi'an Famous Foods. Located in the basement of a shopping mall, the setup reminded me of childhood meals in Hong Kong at all the tasty cheap places that we no longer seem to visit. As long as the kitchen is clean, I don't care if the tables and stools are plastic, or the crockery is chipped. In small establishments like the ones in the mall, the owner focuses on a small menu, a handful of dishes that have been perfected over time, and everything else is unnecessary distraction. There was only one thing on the menu that I wanted: ròu jīa mó. Traditionally from Xi'an it is either made from pork or lamb (in the Muslim areas). When I visited China in 2008, I had ròu jīa mó from a street cart on my first night. For the rest of that trip, I drove the tour group mad by asking our guide to point out where I could find it in each town we visited subsequently, to the point that one member of our party exclaimed "does she think about anything other than food?!". Our guide for that trip, Aaron, hailed from Xi'an and explained that the Xi'an version contains just the stewed meat but other cities have bastardised it by adding fresh chili or coriander. I never had the heart to tell Aaron that I liked both versions. My quest fulfilled, it was time to head back to Manhattan but I will definitely be making the trip out to Flushing next time I am in New York. Now I just need to put up with my cravings for two more months......Hong Kong, here we come.